At M&H Towing and Repair, we know the importance of getting your vehicle of any size back on the road quickly and affordably. We understand that when one or more of your cars, trucks, motorcycles or RVs are disabled, your bottom line and valuable time are at risk. That’s why we’re proud to deliver a variety of quality services designed to minimize your downtime, and maximize your efficiency and adventure. 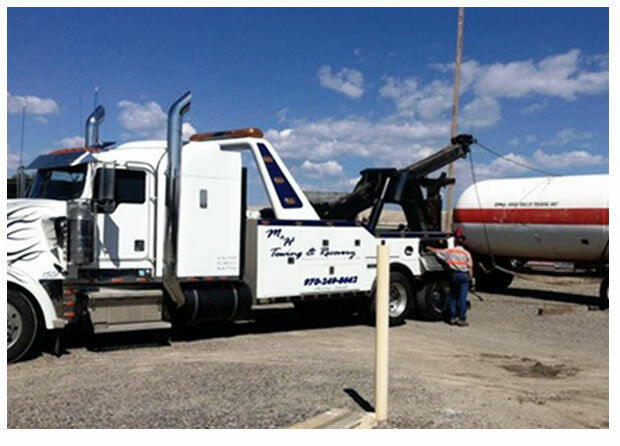 M&H Towing and Repair is committed to your safety, satisfaction and success. From 24-hour, state-of-the-art towing, wrecker and recovery, to minor roadside repairs, our certified pros are equipped with the technology, experience and expertise to provide reliable, prompt and courteous service when you need it! Whether you operate one truck or oversee a fleet, we’ve got you covered during all hours. So, when you find yourself in need of local or long distance towing, recovery, salvage towing, winching or roadside assistance, make M&H Towing and Repair your first call. You’ll discover once you call, you’re hooked! For unsurpassed service, put our fleet and experience to work for you. Our seasoned operators are prepared to ensure your vehicles are safely, accurately and quickly cared for. We pride ourselves on handling even the most challenging tows and recoveries. We’re also driven to exceed your expectations and get you on your way with a variety of roadside services. Turn to us with confidence for local or long distance light duty towing services 24 hours a day, 7 days a week. You’ll find our dispatchers are trained to assess your requirements quickly. Then, we’ll send the correct vehicle on its way in minutes. Plus, every safety precaution is observed by our professional operators to ensure your import or domestic vehicle is handled with the utmost care.